Jaguar Mining Continues to Intercept Significant Gold Mineralization at Orebody C; Pilar and Turmalina Principal Orebodies Report Increasing Grades and Thickness | Jaguar Mining Inc. Productive and ethical working relationships, transparent and responsive dialogue with surrounding communities and public agencies for the benefit of all stakeholders. Toronto, June 18, 2018 – Jaguar Mining Inc ("Jaguar" or the "Company") (TSX: JAG) today announced growth exploration drilling results from 13 underground holes at Turmalina Gold Mine ("Turmalina") targeting depth extensions to Orebody C. The Company also reported results from infill drilling and recent underground access development at Turmalina on Orebodies A and C and Pilar Gold Mine ("Pilar") on Orebodies BF and BFII. Rodney Lamond, President and CEO, Jaguar Mining commented: "We continue to make excellent progress accessing and defining higher grade, thicker portions of principle orebodies at both Turmalina and Pilar mining operations. 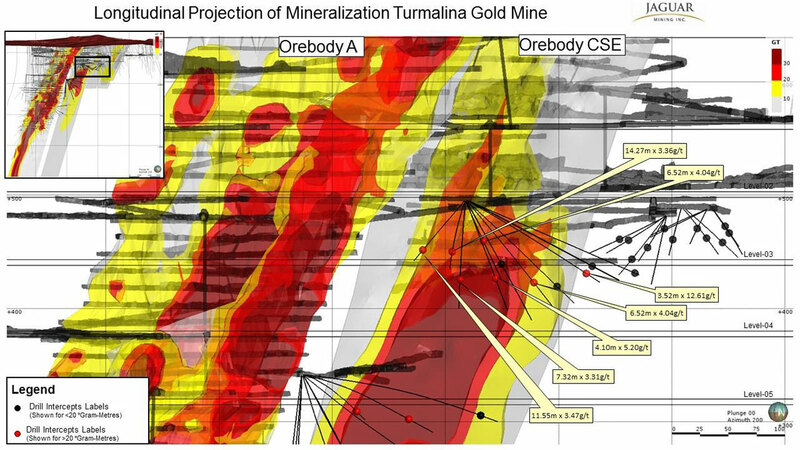 The continued success of growth exploration initiatives, with many holes intercepting gold mineralization, particularly on Orebody C at Turmalina, support our view that we have a significant gold system. The addition of Orebody C to our mineral resources inventory, including shallow high-grade mineralization, provides Turmalina additional ore faces and operational flexibility going forward and gives us confidence in our ability to deliver on production expectations. At Pilar, the wide, high-grade mineralization now accessed through development further demonstrates and supports our strong belief that Pilar's increased production profile is achievable and sustainable. We continue to invest in maximizing the geological information that new drilling and development bring through our mine geological-structural mapping initiative and these observations will help drive our short and long-term planning." Results from a 13 growth exploration drill holes targeting down dip extensions to Orebody C below level 3 confirm continuity of the structure to beyond 8 level some 300m below current operations. Recent drill results show several very high grade, wide drill intercepts with grade x thickness values > 30 including 7.77 g/t Au over 4.50m (ETW 4.25m), 9.22 g/t Au over 5.85m (ETW 5.11m) and 4.91 g/t Au over 15.10m (ETW (14.65m). These intercepts reflect the down plunge extensions of the central high-grade payshoot currently being-accessed for mining on levels 3 and 4. Four drill intercepts with Grade x Thickness values > 10 GM are also reported. 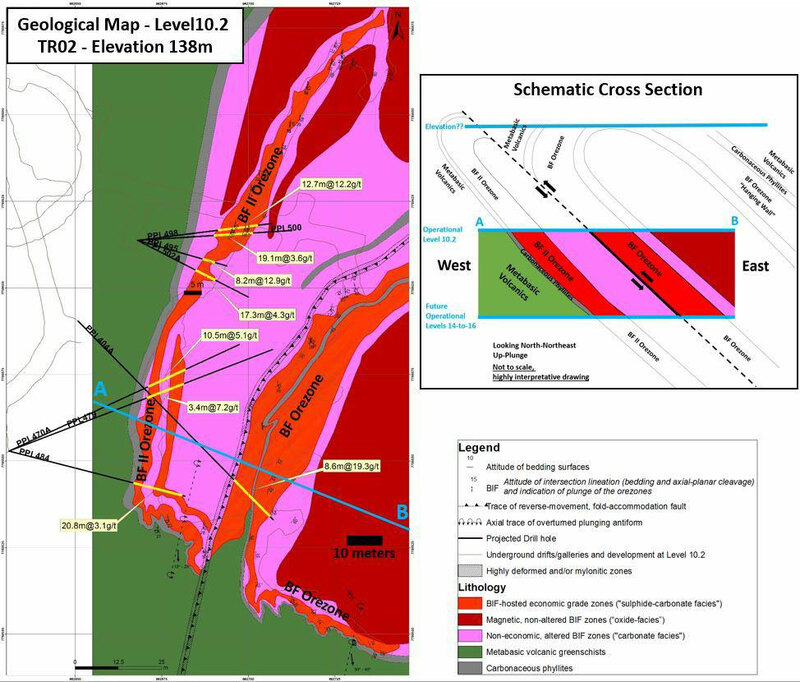 Results from infill drilling and access development from the main ramp on Levels 11.3 and 11.4 confirmed the high grades and thickness profiles as predicted from the geological-resource models previously reported (Refer press release to February 26, 2018). Results from 11 infill holes are reported of which seven holes have intersections with grade x thickness of > 10 GM including two exceptional intercepts reporting 10.94 g/t Au over 17.29m (ETW 17.22m) and 17.23 g/t Au over 5.42m (ETW 5.35m). Results from infill drilling and access development on levels 3 and 4 confirmed the high grades and thickness profiles as predicted from the geological-resource models and reported in the previous press-release (Refer press release to February 26, 2018). Results from 22 infill holes are reported of which 14 holes have intersections with a grade x thickness of > 10 GM including four intercepts with grade x thickness > 30 GM. The two best intercepts reported are 12.61 g/t Au x 4.16m (ETW 3.52m) and 3.36 g/t Au over 14.27m (ETW 14.27m) including 6.17 g/t Au over 5.32m (ETW 5.32m). Importantly, this infill drilling and geological – structural mapping on Orebody C access development has allowed better definition and delineation of the orebody plunge which is now more to the SE (similar to that of Orebody A) and helped define payshoot parameters for the higher grades and thicknesses within the overall mineralized structure hosting this orebody. This information will inform mine design and planning to optimize the extraction of these high-grade areas. Results from infill drilling and underground development on level 10 has exposed wider and materially higher-grade mineralization in principal Orebodies BF and BFII. Results from six infill holes targeting the principle orebodies on this level are reported. Of the 14 individual mineralized intercepts reported from these holes, four have grade x thickness intervals > 100 GM and a further nine have grade x thickness intervals > 50 GM. Pilar commenced a mine wide, geological-structural mapping programme aimed at detailed mapping of all available underground exposure at a scale of 1:100. Mapping of the BF and BFII Orebodies on level 10.2 has demonstrated the high grades exposed on this level are-related to the fold hinges and limbs of two superimposed (by faulting) anticlines, which define the BF and BFII Orebodies. The plunges of these anticlines have been verified by mapping and structural measurements that will aid in targeting further exploration of these important high-grade structures to depth. (Please refer to Figure 4). 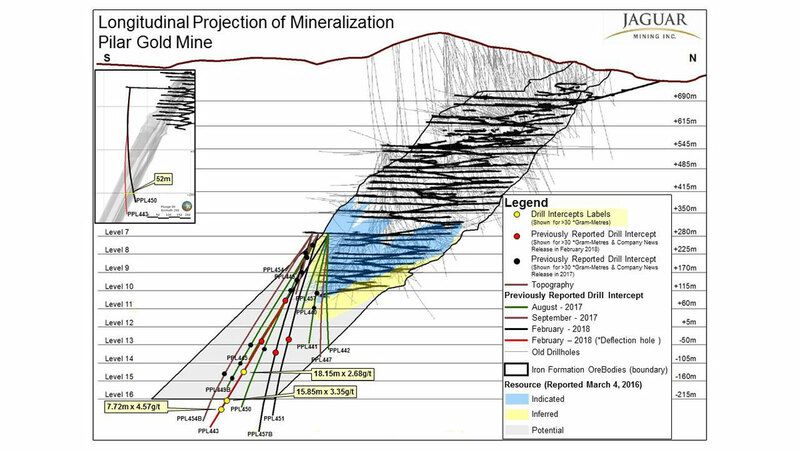 As part of the previously reported growth exploration program at Pilar, drill-hole PPL443 was received reporting strongly mineralized intervals within the targeted down plunge extensions to the principal ore zones below 10 level. Key intercepts include were 2.7 g/t Au over 32.4m (ETW 18.2m) including 6.0 g/t Au over 3.1m (ETW 1.7m) and 8.1 g/t Au over 4.0m (ETW 2.1m) and 3.4 g/t Au over 24.7m (ETW 15.9m) including 13.4 g/t Au over 1.9m (ETW 1.2m) and 7.2 g/t Au over 4.6m (ETW 2.6m). 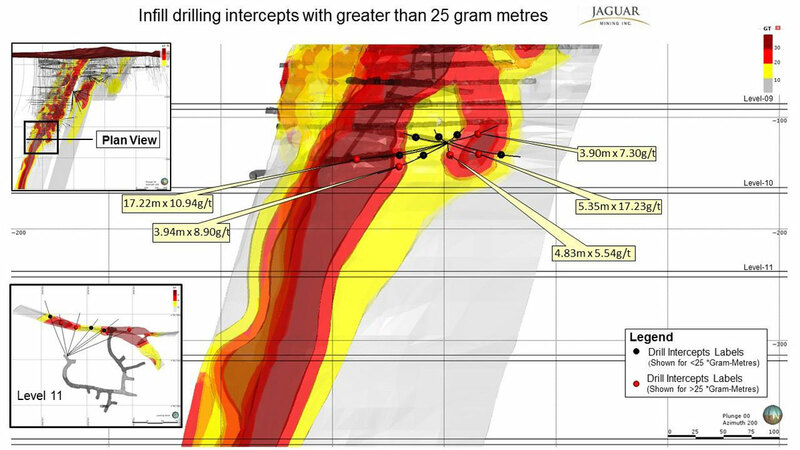 Jon Hill, Expert Advisor, Geology and Exploration, to the Jaguar Mining Management Committee commented: "We are pleased to see closer spaced drill-results and mapping validate the predicted resources inventory as the mining sequence progresses. It is even better when grade and contained metals estimations are exceeded as the orebodies defined by drilling are physically accessed for extraction. As we complete more detailed closer spaced drilling and development, and as mining progresses, drill results demonstrating increasing grade-thickness and ounce per vertical meter have become the norm at Pilar and Turmalina. The positive results reported today again demonstrate confidence in the predictive geological models in use that will allow longer-term life of mine scenario planning to be completed. Drill programs in 2018 remain focused on converting and upgrading the growing mineral resources inventory and upgrading mineral reserves while systematically exploring a growing portfolio of targets within the Company's strategic tenement portfolio." Please note assay results reported in the tabulation below were analyzed at Jaguar's Caeté Laboratory. Please note assay results reported in the diagram below were analyzed at Jaguar´s Caeté Laboratory. During late 2017 and early 2018 Jaguar, as part of its ongoing Operational Excellence program completed a thorough review of Grade Control practices and procedures at its mining operations. This review highlighted several areas for improvement which resulted in the design and roll-out of a Grade Control Intervention at Pilar Mine during May. In parallel with the Mine Mapping Program and other associated Operation Excellence initiatives, the Grade Control Interventions has delivered clear improvements at Pilar. This includes material improvements in the reduction of dilution, planned versus produced grade reconciliations, and reduced operational variability in ROM planned and delivered Plant Feed Grades. A Grade Control Intervention has also recently commenced at Turmalina. Scientific and technical information contained in this press release has been reviewed and approved by Jonathan Victor Hill, BSc (Hons) (Economic Geology - UCT), Senior Expert Advisor Geology and Exploration to the Jaguar Mining Management Committee, who is also an employee of Jaguar Mining Inc., and is a "qualified person" as defined by National Instrument 43-101 - Standards of Disclosure for Mineral Projects ("NI 43-101"). Jaguar continues to use a quality-control program that includes insertion of blanks and commercial standards in order to ensure best practice in sampling and analysis. HQ, NQ, and BQ size drill core is sawn in half with a diamond saw. Samples are selected for analysis in standard intervals according to geological characteristics such as lithology and hydrothermal alteration. All diamond drill hole collars are accurately surveyed using a Total Station instrument and down-hole deviations are surveyed using non-magnetic equipment (SPT Stockholm Precision Tools with GyroMaster™ Solid State North Seeker). Mean grades are calculated using a variable lower grade cut-off (generally 0.5g/t Au). No upper gold grade cut has been applied to the data. However, the requirement for assay top cutting will be assessed during future resource work. Half of the sawed sample is forwarded to the analytical laboratory for analysis while the remaining half of the core is stored in a secure location. The drill core samples are transported in securely sealed bags and sent for physical preparation to the independent ALS Brazil (subsidiary of ALS Global) laboratory located in Vespasiano, Minas Gerais, Brazil. The analysis is conducted at ALS Global's respective facilities (fire assay are conducted by ALS Global in Lima, Peru, and multi-elementary analysis are conducted by ALS Global in Vancouver, Canada). ALS has accreditation in a global management system that meets all requirements of international standards ISO/IEC 17025:2005 and ISO 9001:2015. All major ALS geochemistry analytical laboratories are accredited to ISO/IEC 17025:2005 for specific analytical procedures. The infill drilling results presented on this news release are performed by Jaguar drilling machines and the samples are transported for physical preparation and analysis in securely sealed bags to the Jaguar in-house laboratory located at the Roça Grande Mine, Caeté, Minas Gerais. For a complete description of Jaguar's sample preparation, analytical methods and QA/QC procedures, please refer to the "Technical Report on the Roça Grande and Pilar Operations, Minas Gerais State, Brazil", a copy of which is available on the Company's SEDAR profile at www.sedar.com. The Iron Quadrangle has been an area of mineral exploration dating back to the 16th century. The discovery in 1699–1701 of gold contaminated with iron and platinum-group metals in the south-eastern corner of the Iron Quadrangle gave rise to the name of the town Ouro Preto (Black Gold). The Iron Quadrangle contains world-class multi-million-ounce gold deposits such as Morro Velho, Cuiabá, and São Bento. Jaguar holds the second largest gold land position in the Iron Quadrangle with just over 25,000 hectares. Certain statements in this news release constitute "forward-looking information" within the meaning of applicable Canadian securities legislation. Forward-looking statements and information are provided for the purpose of providing information about management's expectations and plans relating to the future. All of the forward-looking information set forth in this news release is qualified by the cautionary statements below and those made in our other filings with the securities regulators in Canada. Forward-looking information contained in forward-looking statements can be identified by the use of words such as "are expected", "is forecast", "is targeted," "approximately," "plans," "anticipates," "projects," "continue," "estimate," "believe," or variations of such words and phrases or statements that certain actions, events or results "may," "could," "would," "might," or "will" be taken, occur or be achieved. All statements, other than statements of historical fact, may be considered to be or include forward-looking information. These forward-looking statements are made as of the date of this news release and the dates of technical reports, as applicable. This news release contains forward-looking information regarding potential and, among other things, expected future mineral resources, potential mineral production opportunities, geological and mineral exploration statistics, ore grades, current and expected future assay results, and definition/delineation/exploration drilling at the Pilar Gold Mine and the Turmalina Gold Mine in Brazil, as well as forward-looking information regarding costs of production, capital expenditures, costs and timing of the development of projects and new deposits, success of exploration, development and mining activities, capital requirements, project studies, mine life extensions, and continuous improvement initiatives. 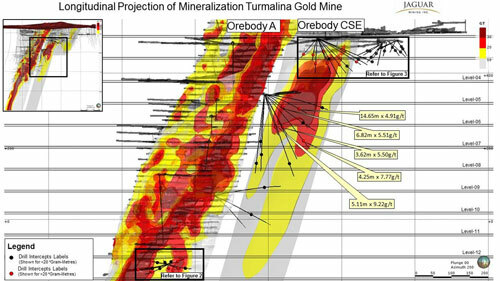 The Company has made numerous assumptions with respect to forward-looking information contained herein, including, among other things, assumptions about the estimated timeline and for the development of the drill program at the Pilar Gold Mine (and its expanded exploration footprint) and the Turmalina Gold Mine; its mineral properties; the supply and demand for, and the level and volatility of the price of, gold; the accuracy of reserve and resource estimates and the assumptions on which the reserve and resource estimates are based; the receipt of necessary permits; market competition; ongoing relations with employees and impacted communities; and political and legal developments in any jurisdiction in which the Company operates being consistent with its current expectations including, without limitation, the impact of any potential power rationing, tailings facility regulation, exploration and mine operating licenses and permits being obtained and renewed and/or there being adverse amendments to mining or other laws in Brazil and any changes to general business and economic conditions. Forward-looking information involves a number of known and unknown risks and uncertainties, including among others: the risk of Jaguar not meeting its plans regarding its operations and financial performance; uncertainties with respect to the price of gold, labor disruptions, mechanical failures, increase in costs, environmental compliance and change in environmental legislation and regulation, weather delays and increased costs or production delays due to natural disasters, power disruptions, procurement and delivery of parts and supplies to the operations; uncertainties inherent to capital markets in general (including the sometimes volatile valuation of securities and an uncertain ability to raise new capital) and other risks inherent to the gold exploration, development and production industry, which, if incorrect, may cause actual results to differ materially from those anticipated by the Company and described herein. In addition, there are risks and hazards associated with the business of gold exploration, development, mining and production, including without limitation environmental hazards, tailings dam failures, industrial accidents and workplace safety problems, unusual or unexpected geological formations, pressures, cave-ins, flooding, chemical spills, and gold bullion thefts and losses (and the risk of inadequate insurance, or the inability to obtain insurance, to cover these risks). Although we have attempted to identify important factors that could cause actual actions, events or results to differ materially from those described in forward-looking statements, there may be other factors that cause actions, events or results not to be as anticipated, estimated or intended. There can be no assurance that forward-looking statements will prove to be accurate, as actual results and future events could differ materially from those anticipated in such statements. Accordingly, readers should not place undue reliance on forward-looking information.